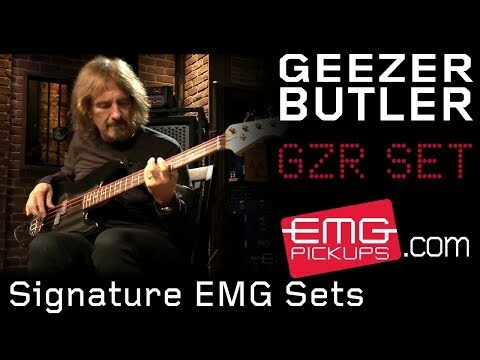 EMG along with legendary artist Geezer Butler have collaborated to develop the GZR-P and GZR-PJ signature bass pickup sets. The Rock and Roll Hall of Fame bass player started working with EMG founder Rob Turner in 2011, looking to recreate the classic bass tones he had in Black Sabbath’s early days. 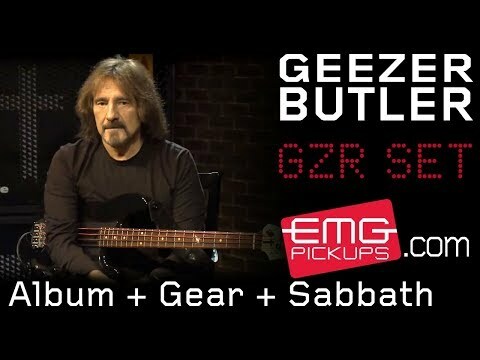 As Geezer and Black Sabbath moved from studio to touring in 2013 the final component of getting the classic Geezer tone was in play - a passive pickup with a truly vintage tone an feel. I just got these today and it took me 30 minutes to install. I got a fender p bass left handed bass and I just followed the instructions as displayed. No issues at all. The only thing is that the emg logo will be under a and d strings for the bridge pick up. I can deal with it. Sound is amazing and you will not regret it. Follow the instructions on the paper. Use the foam from package to place under each pick up so you can adjust the height once you set it up. Your search for tone ends when you buy these. Recently purchased a Fender MIM P....great feel, neck and body paint was awesome, but I was not impressed with the sound of the stock pickups. Picked up a set of Geezers....and like magic my sound improved. I slid them in, easy to install. Saw someone above talk about foam backing not included, but the packaging the Geezers were packed in provided the foam for me, cut to shape and installed. Keepers. 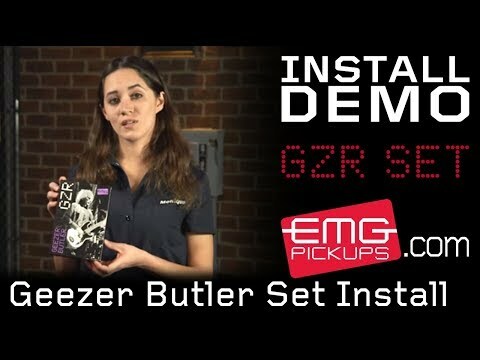 Bought these do to ease of installation, being new to the install process I did have a bit of an issue with the pickups and how to get them at the right height setting. I did eventually us some foam to get it right or at least close. Guys you should have this info for the new users. But thank you for a really great sounding pickups and plug and play installation that is awesome. I installed the P/J set in my Squier Vintage Modified Precision bass as an upgrade to the factory units. I really wanted an authentic vintage sound more than a "Hard rock" or "Metal" sound and what sold me on these was Geezer saying they were the closest to his '68 Precision Bass that he had ever heard. After I ordered these I planned on using all CTS pots and soldering the connections instead of the supplied pots and plug-in connections. Once I got the package in my hands I was completely blown away! Everything is of such high quality I just used what came in the package and never looked back. I still can't get over how great they sound - at any volume setting. I never write reviews, but I was so happy with this I wanted to share with everyone else and let you know if you're even considering these, then don't think about it anymore and order some! Seriously, thank you EMG for helping me find the sound I've been searching several years for! I made a simple Vintage Modified Squier Pbass into a wonderful bass, just by adding these pickups and a KickAss bridge. Here I am with a super extra bass. I loved it so much that I bought the PJ set for my Mexican Fender PBass. Again, this is the best idea I had with this bass. The sound is really big. BEST EMGS IVE EVER HAD. MY TONE HAS NEVER BEES SO CONTROLED WITHOUT OVER CRUNCHING. EMG NEEDS TO MAKE A SIMILAR JAZZ SET SO I CAN HAVE IT WITH BOTH MY BASSES. Went and bought a new bass to get some warm tones and wanted to spruce up my original Lotus from ‘95 to get that bright hard punchy bass. The Lotus had been using the original junky pickups for over 20 years, and for a little over a hundred bucks it got a new lease on life. I love playing it. Installation was easy, with the caveat that I’m left handed and I was really hoping I could get used to the pots being backwards from what I’m used to. I keep going the wrong direction, and I thought these might be reversible but haven’t found anything yet. I've tried them all, and this was the sound I was looking for in a P style bass pickup. I've used EMG pickups in precisions since 1987, but this was the first passive set I tried from them. Wow, the installation is a breeze with the solderless connectors, and everything fell into place with plenty of room. The sound is pure rock and roll bass. Everything from creamy 70's tones with flats and the tone rolled off a little, to the 80's piano sound with a pick and SS roundwounds, or today's argressive but manicured sounds. It's all there with this pickup set. The pickup is tame with a midrange bump and tigh lows and little flat on top when played lightly. Where it truly shines is digging in a little and getting the growl that this pickup does so well. It retains it's low end, but the midrange growl, which is what so many of us love from a precision, is done perfectly. And I mean they nailed it. i play through an SVT CL into various cabs, and it just kills. It's perfect. If you are on the fence and looking for a passive set of pickups for a p style application, give these a try. if you love the sound of a driven P bass without a thick muddy bottom, but retaining the beautiful midrange growl, these are your pickups.